How to Organize a Small Space? Use the Walls! 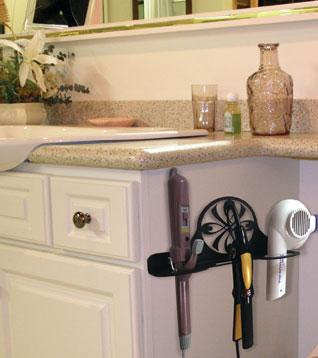 Using the walls is a great strategy any time storage space is limited —and there are many cool products to help you. 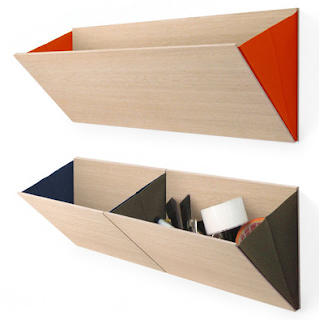 This wall storage unit comes from House Doctor, and is sold at Bodie and Fou. Urbio was designed as "the magically magnetic urban vertical garden" — but somewhere along the line, the company seems to have realized it had a wider use than just that. 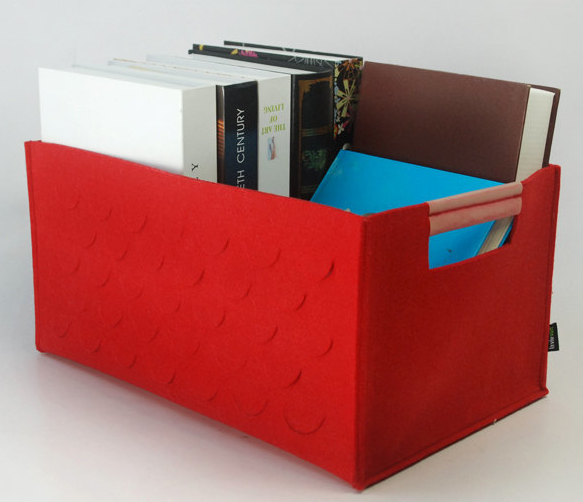 Now you can find Urbio in places like The Container Store and EQ3 — and the modular wall organizer at Uncommon Goods sure looks like Urbio. 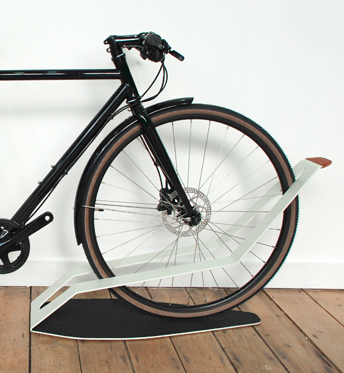 Want to just stand your bike up in your garage, or elsewhere in your home? When I was a kid, my bike had a kickstand, so that was easy. 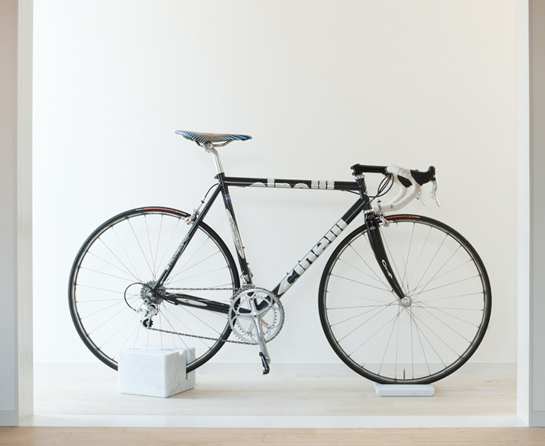 But many bikes no longer come with kickstands — although it seems you might be able to add one. 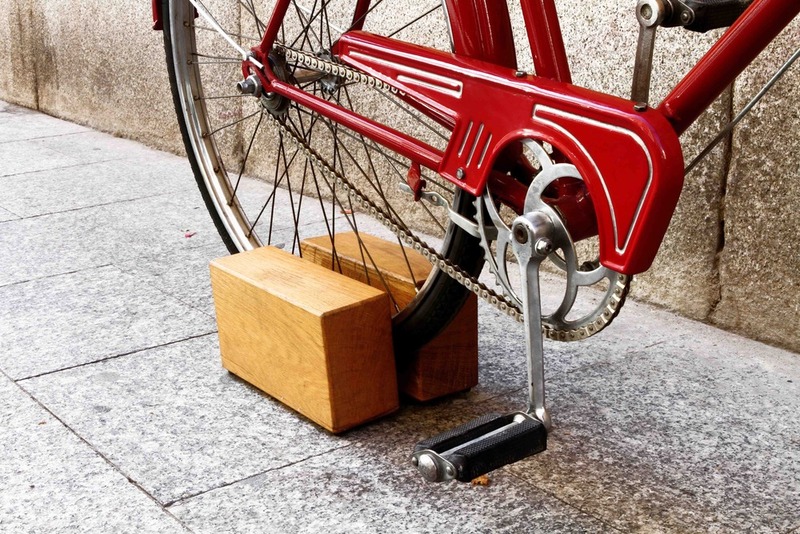 And you could try using something like the Upstand, which is sort of a removable kickstand — or the Click-Stand, a folding portable kickstand. 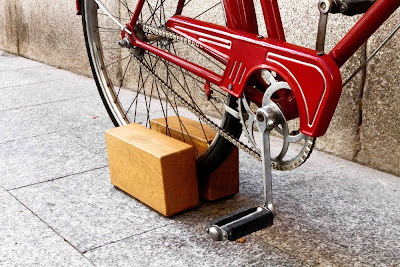 But there are also plenty of stands available to hold your bike in place. 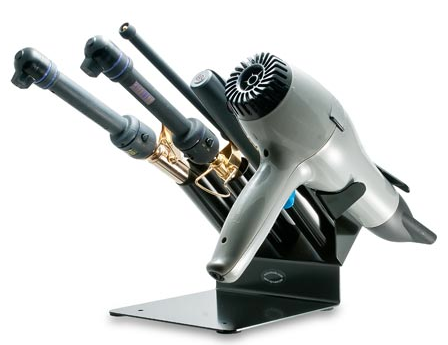 For example, you can get one from Racor, Art of Storage or Gear Up. And if you want one that's eye-catching as well as functional, you can get that, too. 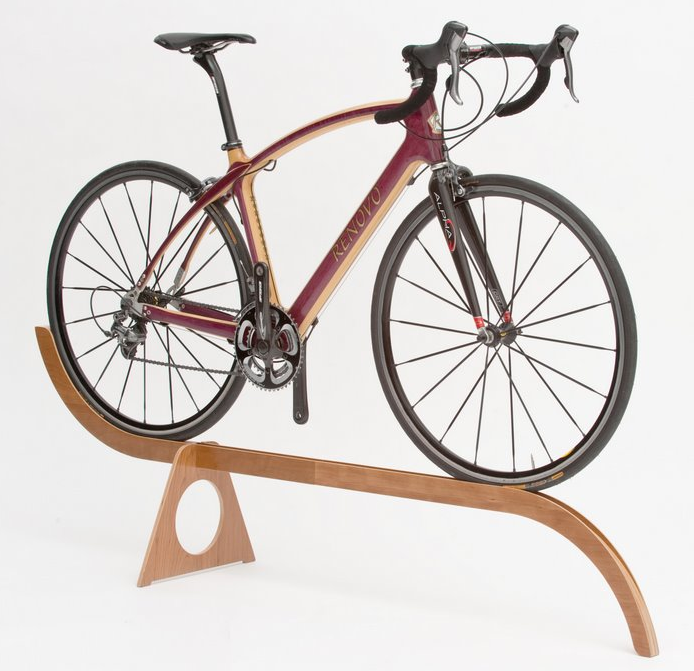 The bike stand at the top of this post comes from Dale Pedals, and it's "made out of oak from recycled beams that used to belong to past century buildings." Update on April 21, 2015: I'm not longer finding this product. 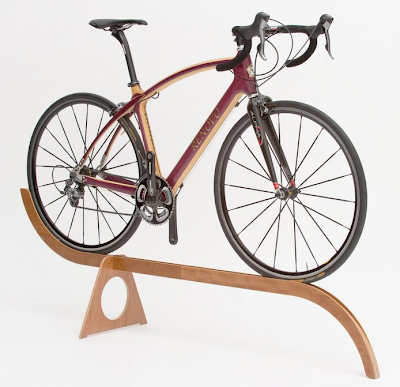 The Renovo bike stand is made from birch plywood. It comes in two colors, cherry and black. 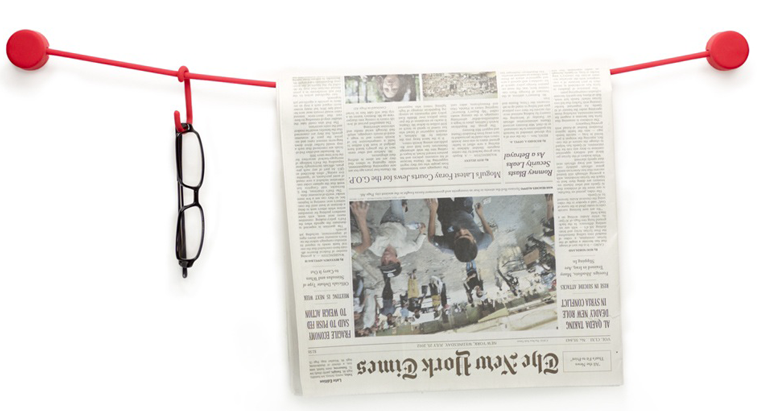 Shadow, from Quarterre, is made from folded steel. Many forms of multitasking might make you less productive — but multitasking while driving might make you (or someone else) dead. I rarely share a video, and I rarely share a single item. And I very rarely share something produced by a corporate entity like AT&T. But I saw this video today, and it's a powerful message that cries out to be shared. 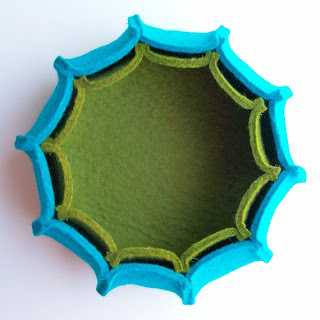 For those who like at least some of their storage containers to be out of the ordinary — and soft — I've got an assortment of felt storage containers to show you. Let's start with Amy Herbst, who mostly sells her patterns — but she also sells some wool felt nesting bowls she's made herself. I was also pleased to note she's from Santa Cruz, California, which is just about an hour's drive away from me. Hurray for local! 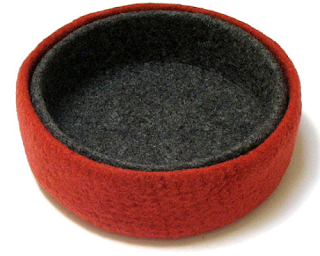 You can also get felted wool bowls — single bowls, or nesting bowls — from Hold of Vancouver, Canada. And another source of felt bowls is Gräf & Lantz. 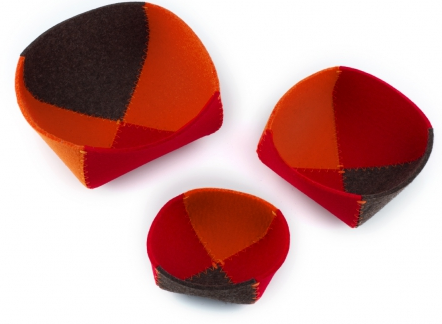 The bowls are available in four different color combinations. You can also find them at Switch, which also has a couple additional felt storage products from the same company. Update on August 6, 2015: Gräf & Lantz no longer seems to make these bowls. 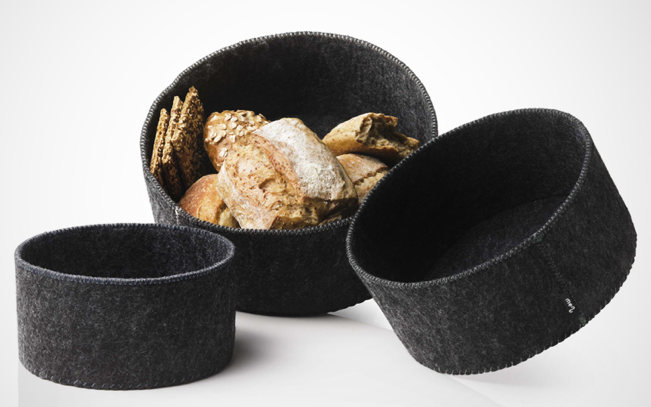 These felt bread baskets were designed by Norm; of course, they can be used for more than bread. They're sold in sets of three. You can also buy them from GSelect and Spark Living. Update on August 6, 2015: Spark Living seems to have disappeared. 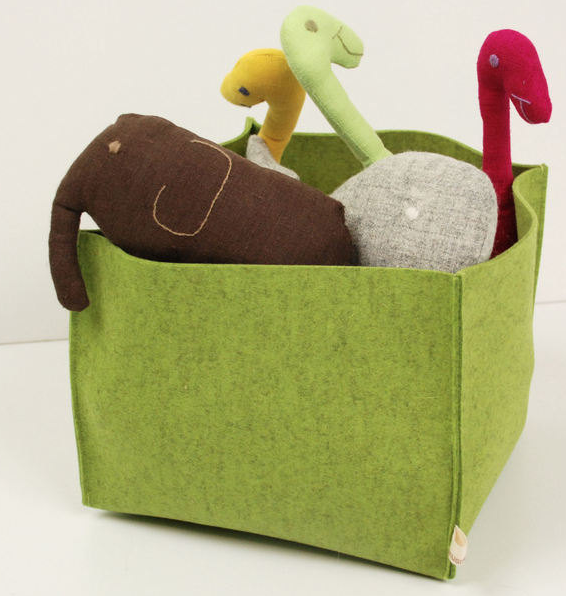 Manusmade has some felt baskets in luscious colors, as well as neutrals. I still remember the difficulty of piecing together the medical histories and treatment plans of Hurricane Katrina victims back in 2005. Hopefully, most of us will never need to experience an evacuation. But all of us should have key medical information — our medications, our doctors, our insurance, our immunizations, our medical history — at our fingertips. And fortunately, I've recently seen some helpful tips on just how to do that. Seth Godin has created a simple form to fill out. 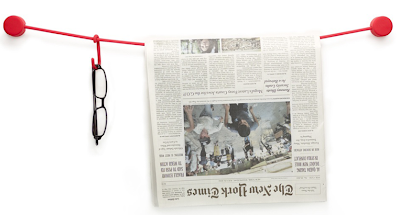 Lisa Bonchek Adams, who is dealing with metastatic breast cancer, writes about the must-have medical binder. This focuses on cancer patients, but it will also provide good ideas for anyone, especially those with complex medical issues. 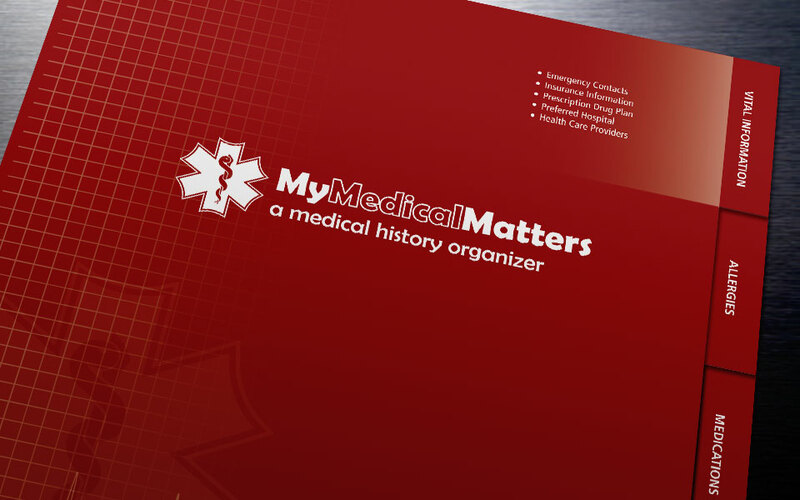 If you'd prefer to just buy a binder that's already set up, and start filling in the information, you could consider the one from My Medical Matters. 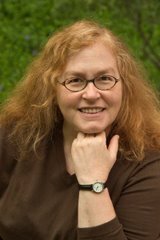 And Jacki Hollywood Brown reminds us that we need similar information for our pets; she writes about organizing horse health records. 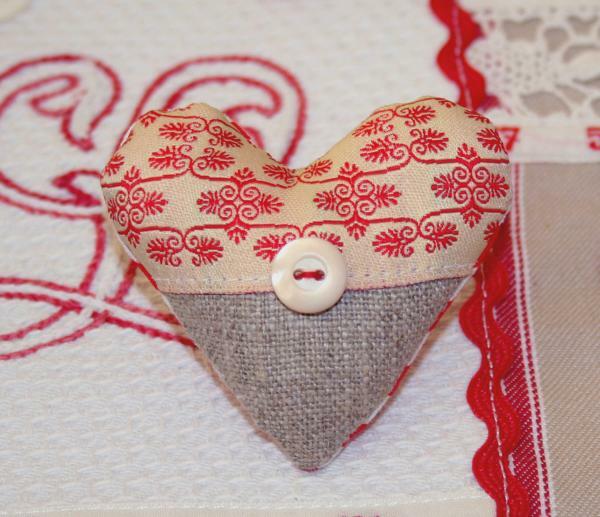 Valentine's Day — or any day, really — is a good time to remember those we love. 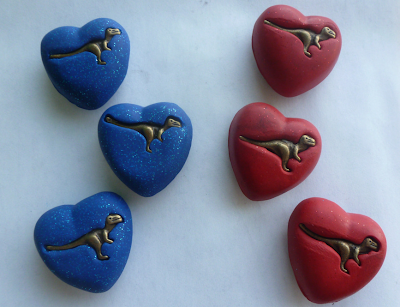 So here are some heart-shaped magnets for those who use refrigerator doors or magnetic boards as an organizing tool. 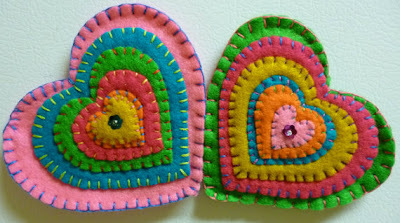 Let's start with the wonderfully colorful heart-shaped magnets, made of felt, from Jessica Ramirez. Update on Jan. 29, 2013: Jessica's Etsy store no longer sells these magnets. Créations d'Antan has a number of vintage-style fabric hearts; each has a strong magnet on the back. And there's something about these heart-shaped magnets with the dinosaur in the center that delights me. 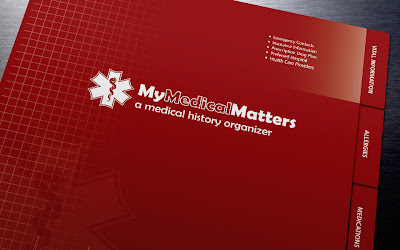 How Long Should I Keep My Medical Paperwork? How long to keep paperwork is something almost everyone struggles with — and medical paperwork is no exception. 1) Do they support deductions on a tax return? 3) Is there any medical history information that would benefit the person or other family members that would not be available if these were destroyed? If the answers to all are no, then I think they can safely dispose of them. If there is sensitive info — like a social security number since insurance companies used to (may still?) use that for the membership ID — I shred. If 2 is a Yes, then they need to keep until everything is resolved. If 3 is a Yes, then I suggest this be a project with a completion deadline. Connie also mentioned that, for those who are anxious, they might scan the documents into Evernote so they will be searchable, and then let go of the hard copies. 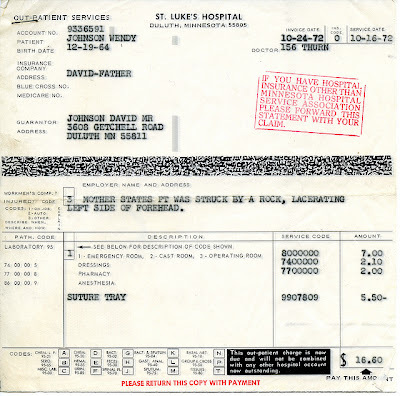 Other organizers have noted that they've experienced delayed billings or insurance snafus related to services rendered as long as seven years ago, and having their medical paperwork helped clear things up. So if you want to err on the side of caution, you might want to keep records for a while even if they don't meet the logical criteria that Connie listed; again, you can keep them in digital form if you don't want to keep the paper. Want some more perspectives? An article in The New York Times said basically the same thing as Connie did. You can also read the advice from the AARP, which includes a recommendation to shred any records you dispose of that have any personal information, including your health insurance ID number, to help avoid medical identity theft. One final thought, regarding Connie's third question: I'm a huge advocate for having your medical information and history pulled together and readily available for yourself, your family and your doctors. There are many ways you can do this — but that's a topic for another blog post. Credit: Photo by Wendy Diedrich, found on Flickr, licensed through Creative Commons. 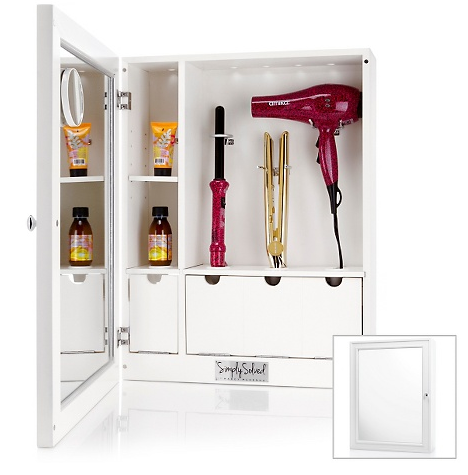 I don't own a hair dryer, curling iron, or any other such products — but I know many people do, and storage can be a challenge. 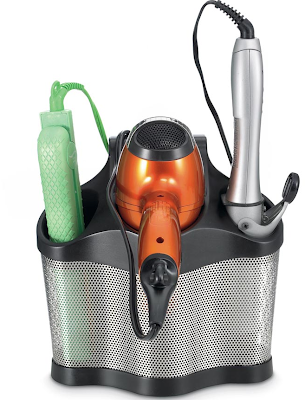 So let's look at some of the more interesting products designed for storing these hair care items. And let's start with countertop caddies, like the StyleAway, shown above, which comes in black or ivory. 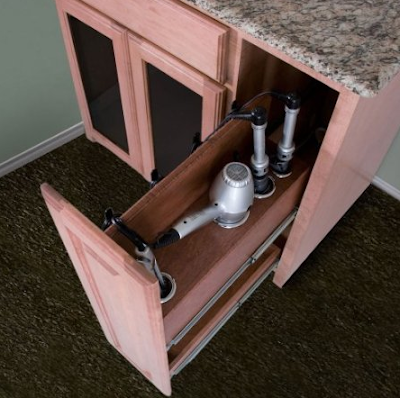 It's designed to hold most heated appliances, and it will hang over a towel rack as well as sitting on a counter. 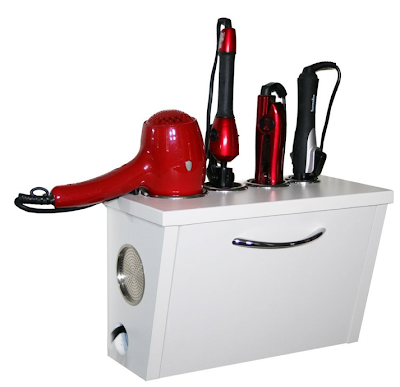 Kangaroom has a hair styling station in rattan, with ceramic interior liners. 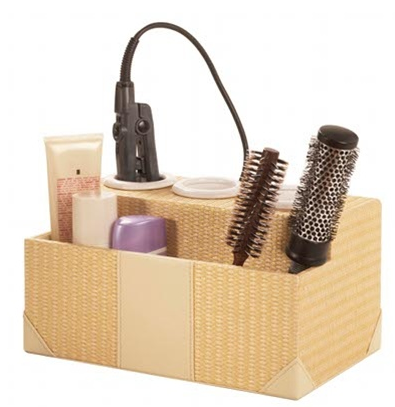 PBTeen has a hair accessories organizer made of MDF; it has a lacquer finish. For yet another look, there's the Polder Style Station, made of stainless steel mesh and plastic. There's a "high heat silicon inner base pad" to "allow hot items to safely cool when stored." 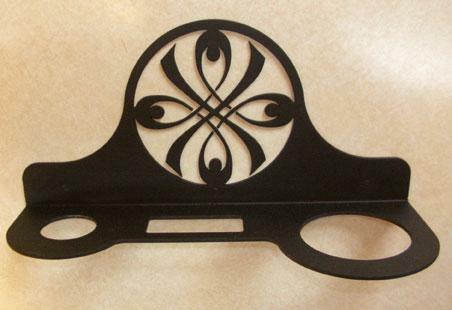 This one, like the StyleAway, can also hang from a towel bar. 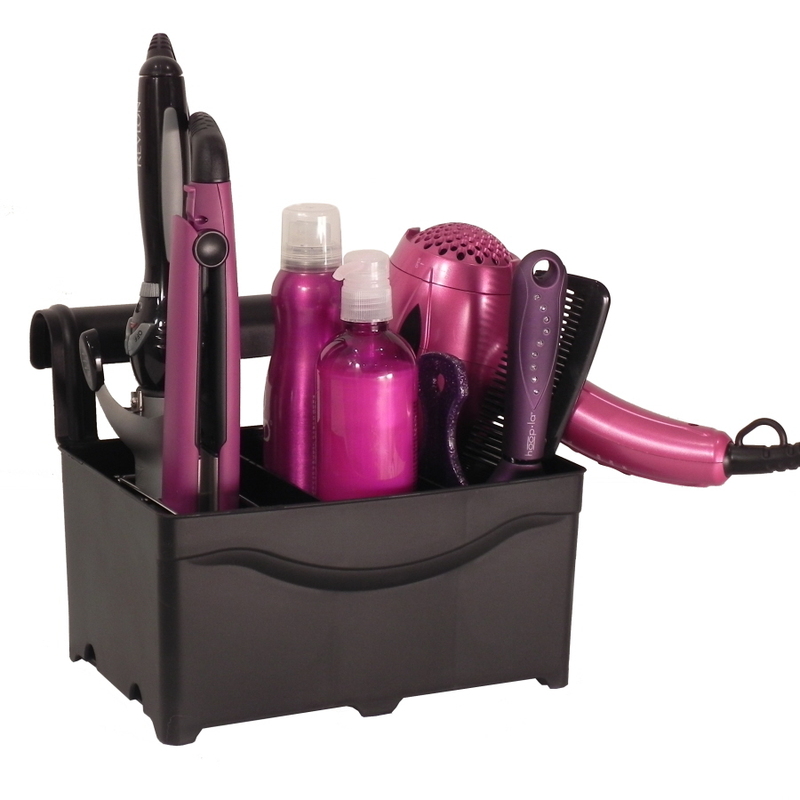 The Polder Styling Station is a smaller version of this product. 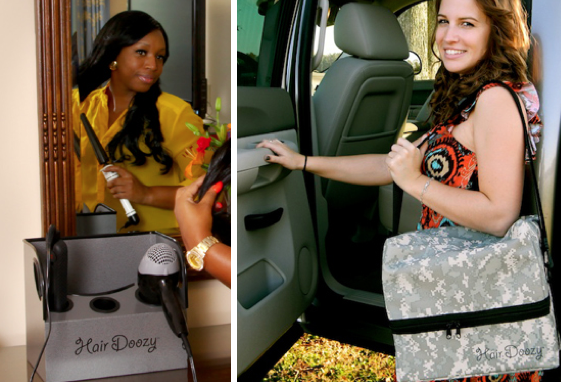 And then there's the Hair Doozy - a countertop product that comes with an optional canvas carrying pack. 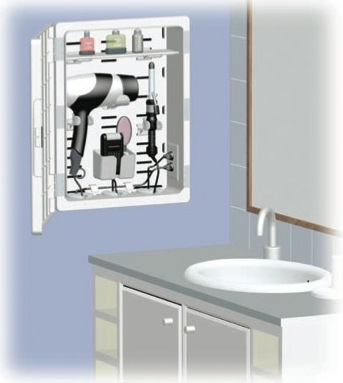 Wall-mounted products are another way to go. The most interesting one I found is the hair care caddy from Ironworks; there are six designs available. The appliance holders from Salon Made can be used on a countertop or they can be wall-mounted. And then there are the wall-mounted cabinets, like the Style and Go Hair Care Valet. It seems to be sold out at the minute, but you can sign up for the waiting list. It's sold through HSN. Another such product, with a different look, is the HairCare Hideaway. Finally, there are the products from Pojjo, sold on its site, through Home Depot, and through Amazon.com — and brought to my attention by Debbie Wolfe. 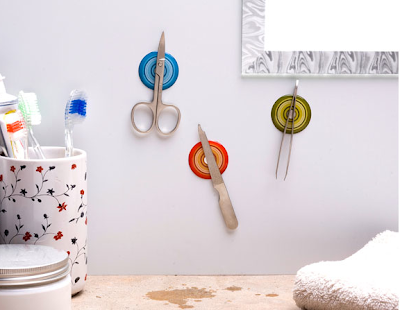 There's the wall-mounted holder, available in a number of finishes. 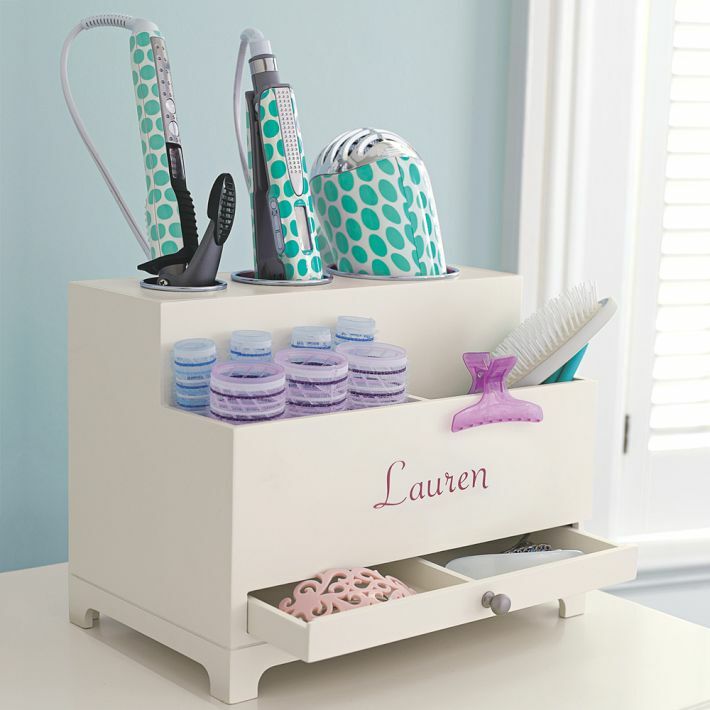 But the company also makes this vanity valet pullout — and a number of other interesting options for a vanity.